The music program at Clark Montessori currently features several Jazz Ensembles, a Drum Line Ensemble, and multiple Steel Drum bands. For complete information, including a schedule of performances and contact information for the directors, please visit the Clark Montessori Music Department ». To provide support and assistance to the directors of the music program at Clark Montessori High School. To provide financial support for the needs and enrichment of the music program at Clark. To promote a sense of community among the Clark music teachers, the music students and their parents, and the Clark community, at large. To increase the participation levels of the parents and students in the music program. To perform fund raising activities and obtain donations that will cover the cost of new instrument purchases, instrument maintenance, transportation, sheet music, and other necessities constructive to quality music performances. The Clark Montessori Athletic Booster Club is a non-profit organization dedicated to supporting the athletic programs and athletes at Clark Montessori, grades 7 through 12. The Boosters help out where our tax dollars and district budgets fall short. In the past decade, we have funded over $200,000 in additional athletic programming for the athletes in our junior and senior high schools. About 10 years ago, when Clark Montessori had just started to have athletic teams as extra-curricular activities available to its students, parents of Clark Montessori student-athletes saw the need for funding over and above what the District provided. With Ty Steele’s inspiration and leadership, Clark Montessori Athletic Boosters was created. Over the years, our Boosters have raised more than $200,000 for the benefit of Clark Montessori athletic teams and their student-athletes. This funding has been instrumental in the growth of the number of teams available to Clark Montessori students and increasing the number of athletes who participate on those teams. 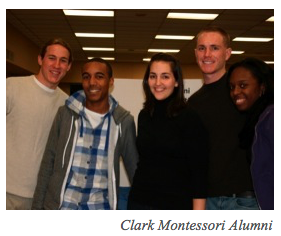 Funds raised by the Clark Montessori Athletic Boosters directly benefit the athletes at Clark Montessori. As part of our commitment to support our athletes, we work with the Athletic Director to determine what needs our help. The projects below were funded in whole or in part by Clark Montessori Athletic Boosters. Remember how much fun you had with your friends at Clark and all the bonding experiences of fall camp, Andros, and spring intersessions? How about Senior Project; what did you do, and what other projects stand out in your mind? Remember playing in the jazz band, steel band, or on sports teams? Remember being in an Epic Productions play? These Clark experiences had a hand in directing you down the path you follow today. And wherever you go in life, you're liable to find that not many people can understand the kind of learning you experienced at Clark. You can reconnect with fellow "Clarkies" and reminisce about the foundational events that occurred during your time here!